Follow the Stubborn Mule Ainigmata Ostraka from the Cave of Mt. 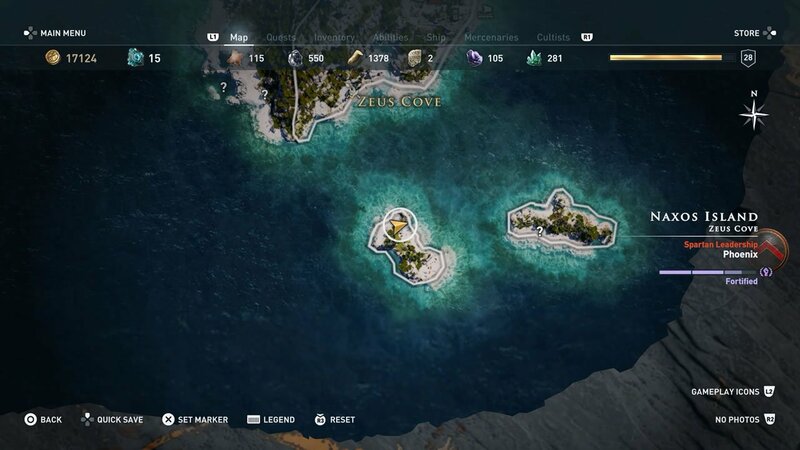 Zas to a reward hidden on an island within Zeus Cove. 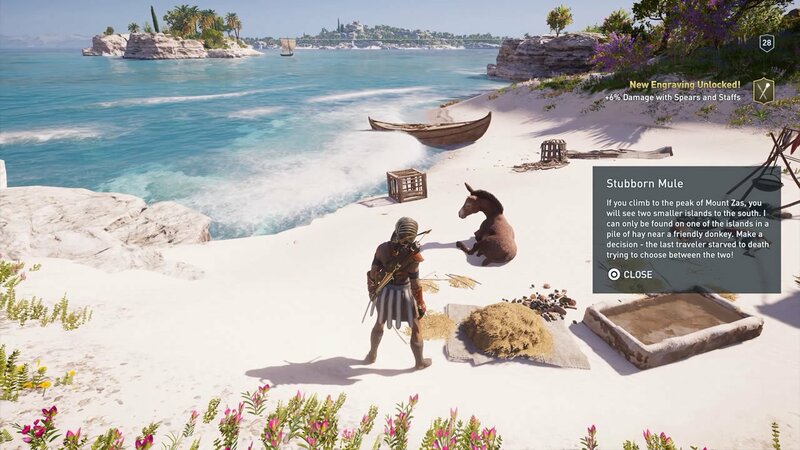 Another in a long series of treasure hunts, Ainigmata Ostraka mini-quests in Assassin's Creed Odyssey provide players a chance to explore Ancient Greece and earn some useful rewards in the process. The Stubborn Mule Ainigmata Ostraka can be found within the Cave of Mt. Zas as part of the Death and Disorder quest line, and points to an engraving hidden on an island in Zeus Cove. "If you climb to the peak of Mount Zas, you will see two smaller islands to the south. I can only be found on one of the islands in a pile of hay near a friendly donkey. Make a decision - the last traveler starved to death trying to choose between the two!" With our guide in tow, players won't have to starve themselves looking for the Stubborn Mule Ainigmata Ostraka reward. The clue phrase is pointing to a location in Naxos Island, itself set within Zeus Cove. The riddle's namesake stubborn mule can be found on the island's northern shore, and presumably the mule is stubborn simply because he hasn't moved — or eaten the pile of hay — between the time when the tablet was etched and the hero arrived. At the campsite on the beach, approach the stack of hay resting near the mule's watering trough. Approach it and use the Interact button to claim the hidden reward: an engraving that adds 6% damage with spears and staffs. With the Stubborn Mule Ainigmata Ostraka wrapped up and its hidden reward obtained, players are free to move on to the rest of the engravings spread about Ancient Greece. 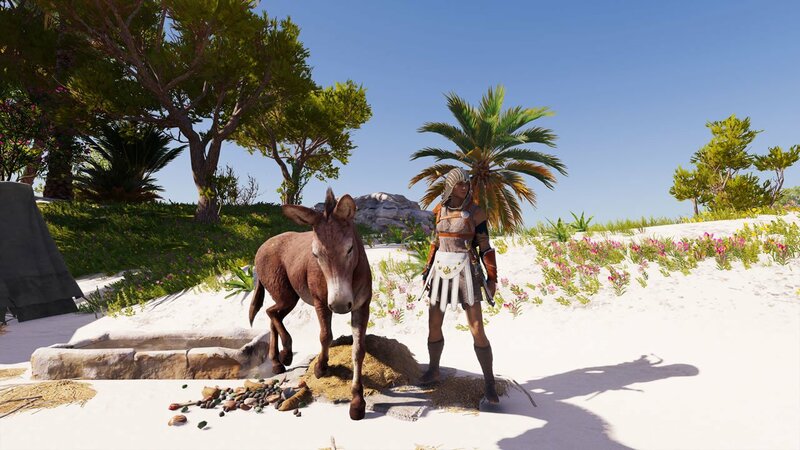 To learn the location of the others, or to brush up on Cult of Kosmos quests, boss strategies, or miscellaneous trivia, be sure to head over to Shacknews' Assassin's Creed Odyssey walkthrough and guide.